Dress up your Corvette with our Polished - Stainless Steel, Fuel Rail Covers with "CORVETTE" script. These trim pieces are designed to fit all 2005-2007 C6 LS2 or 2008-2013 C6 LS3 Corvettes over the plastic fuel rail covers and add a clean stylish look to your Corvette engine bay. 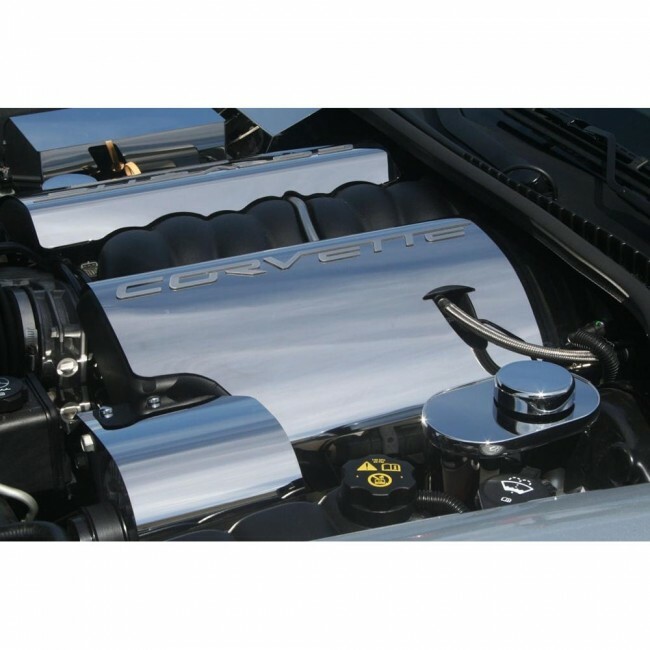 Dress up your Corvette with our Polished - Stainless Steel, Fuel Rail Covers with "CORVETTE" script. These trim pieces are designed to fit all 2005-2007 C6 LS2 or 2008-2013 C6 LS3 Corvettes over the plastic fuel rail covers and add a clean stylish look to your Corvette engine bay. RETURN POLICY: May be returned, in resaleable condition, within 30 days from date of order with an RMA (Return Merchandise Authorization). A standard 15% re-stocking fee will be deducted from the refund amount. The customer is responsible for all shipping charges. DAMAGED IN SHIPPING: Damaged items must be reported within 24 hours of delivery. Shipped directly from manufacturer. Please allow up to 10-14 business days for delivery. May only be shipped using Standard Shipping.